The in-game charges which added up to hundreds or even thousands of dollars were part of a system of "friendly fraud," according to Reveal News' Nathan Halverson, citing over 135 pages of unsealed documents which include employee emails, Facebook memos and secret strategies. The "friendly fraud" was particularly rampant among the games "PetVille, Happy Aquarium, Wild Ones, Barn Buddy and any Ninja game." Facebook was well aware of the issue - even developing a method that would have mitigated the excessive in-game purchases, however the company did not implement it, "and instead told game developers that the social media giant was focused on maximizing revenues," reports Reveal. Some parents turned to the Better Business Bureau (BBB) to lodge complaints, while others turned to the courts or their credit card companies for a refund. 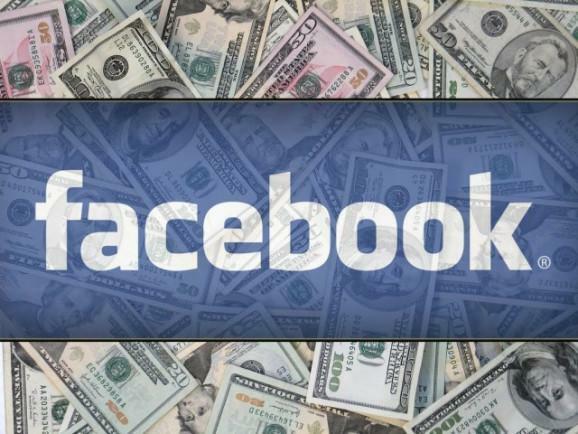 Facebook's chargeback rate of 9 percent far exceeded the Federal Trade Commission's red-flag level of 2 percent for a "deceptive" business. 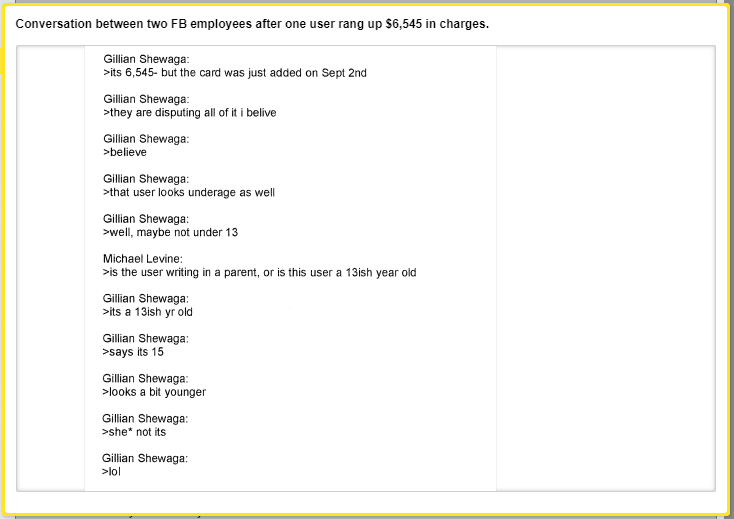 "If the devs are really concerned about the cbs and not refunds it could make sense to start refunding for blatant FF-minor," wrote Facebook employee Tara Stewart to a colleague on July 8, 2011 - suggesting that perhaps the company should just refund money to parents when their minor children clearly used a credit card without permission. Several months before this email, Stewart launched an internal initiative to help Facebook minimize credit card chargebacks from outraged parents who said their kids were tricked into the in-app purchases. An internal Facebook survey found that a lot of parents had no idea Facebook was even retaining their credit card information, nor did they know their children could use them without re-entering a password or another type of verification. In order to test whether kids were being duped, Stewart and her colleagues conducted an experiment in which children were required to re-enter the first six numbers of their parents' credit card on certain games before they were allowed to spend money. The test worked, according to Stewart - who called it a "good first step" as it lowered the number of refund and chargeback requests. "It forces the minor to prove he is in possession of the credit card," wrote Stewart. "Often refunds/cbs occur because a parent permits his child to spend at a small denomination and doesn’t realize that the CC info will be stored." Unfortunately for Stewart's idea - it would likely hurt Facebook's revenue, so the company never implemented the changes that would block children from unwittingly spending their parents' money into the thousands of dollars in some cases. A few months before she launched her project in mid 2011, Facebook had uncovered some troubling data about the children playing its games. They were requesting refunds and demanding chargebacks at extraordinarily high rates. The company had analyzed data on game revenue from children for the time period Oct. 12, 2010 to Jan. 12, 2011. The children had “spent a whopping $3.6 million” during the three-month period, according to the report. But the company had discovered that more than 9 percent of the money it made from children was being clawed back by the credit card companies. Rovio, maker of Angry Birds, expressed concern over Facebook's high chargeback rates according to an email exchange between companies. "We have been seeing refund rates of 5-10 percent in terms of credits spent so far on Angry Birds. This seems quite high to me, but it might just be normal for games on Facebook," reads the email from Rovio to Facebook. After an internal analysis, Facebook determined that in 93% of cases, chargebacks for Angry Birds were due to the credit card holder not being aware that the game was charging their account - while the average age of those playing the game was 5-years-old.